Bartlett, F.C. (1932). Remembering. Cambridge, England: Cambridge University Press. Brovchenko, I. V. (2011). Kontseptualnaya metafora v klishe angloyazyichnogo nauchnogo teksta [Conceptual meytaphor in the collocations of English scholarly texts]. Unpublished candidate dissertation, Bohdan Khmel'nitsky National University of Cherkasy, Ukraine (in Ukrainian). Chaban, N. and Bain, J. (2014). Framing the EU in a time of crisis: media reflections from EU ‘strategic’ partners in Asia-Pacific. In N. Chaban and M. Holland (eds.). Communicating Europe in times of crisis. The European Union in International Affairs Series. London: Palgrave Macmillan, 118–142. Chomsky N. Language and politics. 2nd ed. (2004). Edinburgh et al. : AK Press, 2004. Dijk van T.A. (1998). Making news: a study in the construction of reality. New York: Free Press. Evans V. and Green M. (2006). Cognitive linguistics. An introduction. Edinburgh: Edinburgh University Press. Feldman, J.A. (2008). From molecule to metaphor. Cambridge, Massachussetts and London, England: The MIT Press. Fisher, G. (1997). Mindsets: The role of culture and perception in international relations, 2nd ed. Yarmouth, Maine: Intercultural Press. Herrmann, R.K. (2013). Perception and image theory in international relations. 2nd ed. Oxford: Oxford University Press. Herrmann, R. K., Voss, J. F., Schooler, T. Y. E., and Ciarrichi, J., (997). Images in international relations: an experimental test of cognitive schemata. International studies quarterly, 41, 403–433. Katz, A.N. (1998). Figurative language and figurative thought: A review. In A.N. Katz, C. Cacciari, R.W. Gibbs, Jr. and M. Turner. Figurative language and thought. New York, Oxford: Oxford University Press. Kemmer, S. (2003). Schemas and lexical blends. In H. Cuyckens, T. Berg, R. Dirven, and Klaus-Uwe P. Motivation in language: Studies in honor of Günter Radden. Amsterdam / Philadelphia: John Benjamins, 69-97. Kövecses, Z. (2000). The scope of metaphor. In A. Barcelona (ed.). Metaphor and metonymy at the crossroads: A cognitive perspective. Berlin – New York: Mouton de Gruyter, 79-92. Kövecses, Z. (2002). Metaphor. A practical introduction. Oxford – New York: Oxford University Press. Langacker, R. W. (2008). Cognitive grammar. A basic introduction. New York: Oxford University Press. Lakoff G. (1993). Contemporary theory of metaphor. In A. Ortony (ed.). Metaphor and thought. Cambridge: Cambridge University Press, 202–251. Lakoff, G. (1991). The metaphor system used to justify war in the Gulf. Journal of Urban and Cultural Studies 2(1), 59-72. Lakoff, G. (2002), Moral politics. How Liberals and Conservatives think, Chicago, London: University of Chicago Press. Lakoff, G. (2008), The political mind: Why you can't understand 21st-century American politics with an 18th-century brain, New York: Penguin Group. Lakoff, G. and Johnson, M. (1999). Philosophy in the flesh: The embodied mind and its challenge to Western thought. New York: Basic Books. Movahedi, S. (1985). The social psychology and the politics of international images. Human affairs, 8, 1–11. Radchenko O.Y. (2012). Kontseptual'na metafora v terminosystemi marketynhu [Conceptual metaphor in the terminological system of marketing]. 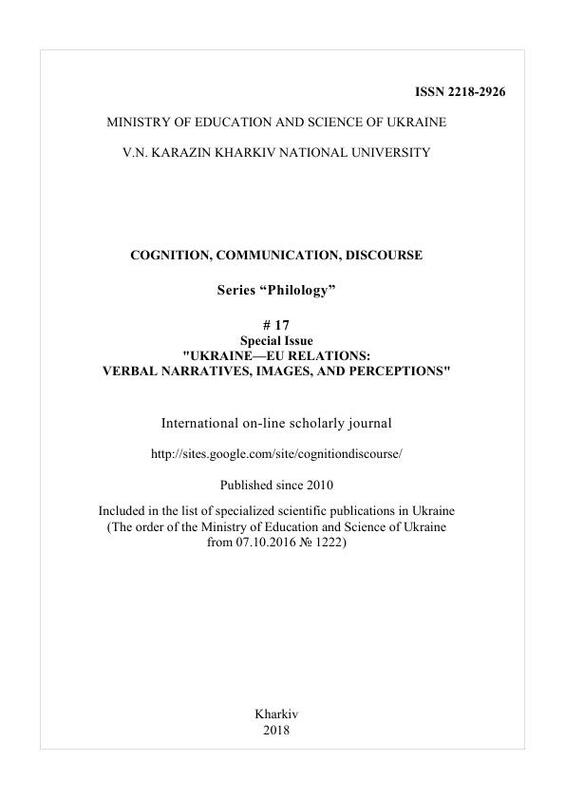 Unpublished candidate dissertation, Bohdan Khmel'nitsky National University of Cherkasy, Ukraine (in Ukrainian). Sadri, H. and Flammia, M. (2014). Democracy, political perceptions, and new media. Systemic, Cybernetics and Informatics, 3 (12), 29-33. Supriadi, L. (2017) A study of conceptual metaphor in a political discourse. International Journal of Management and Applied Science (IJMAS), 5 (3), 6-10. Wodak, R. (2011) The discourse of politics in action: Politics as usual. 2nd ed. Basingstoke: Palgrave Macmillan. Wodak, R. and Forchtner, B. (eds.) (2017). The Routledge handbook of language and politics. London: Routledge. Yavorska, H. and Bohomolov, O. (2010). Nepevnyi obyekt bazhannya: Yevropa v ukrayinsʹkomu politychnomu dyskursi [An uncertain object of desire: Europe in Ukrainian Political Discourse]. (In Ukrainian). Kyiv: Dmytro Burago Publishing House, A. Krymskyi Institute of Oriental Studies of the National Academy of Sciences, Ukraine. Zhabotynskaya, S. A. (2013a) Kontseptualnaya metafora v spetsialnom yazyike: protsedura analiza [Conceptual metaphor in the language for specific purposes: a research procedure]. (In Russian). Inostrannyie yazyiki v vyisshey shkole. (Ryazanskiy gos. un-t imeni S.A. Esenina), 3 (26), 24-32. Zhabotynskaya, S. A. (2013b) Kontseptualnaya metafora: kongruentnoe i nekongruentnoe kartirovanie vo mnozhestvennyih dannyih [Conceptual metaphor: congruent and incongruent mapping in multiple data]. (In Russian). Funktsionalnaya lingvistika (Simferopol), 5, 104–106. Zhabotynskaya, S. A. (2017). Narrativnyie politicheskie kontseptyi: metodika lingvokognitivnogo analiza [Narrative political concepts: methods of cognitive linguistic analysis]. (In Russian). In N. V. Petluchenko (ed.). Kontseptyi i kontrastyi. Odessa: Izdatelskiy dom "Gelvetika", 30-40.